I have developed a serious corn dependence. But I can’t be the only one buying fresh corn from the farmers market week in and week out. Whenever I come within a few steps of the stand with its boxes of just-misted ears and kernels so fresh that they squeak, I succumb. 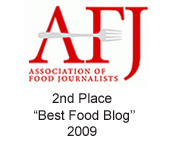 Typically, I tote them home to char on the grill while still in their husks. Sometimes, I take a knife down the length of them to dislodge the milky kernels to saute with garlic, butter and herbs for a side dish or the makings of a room-temperature salad. Creamed corn is not something I grew up with. Nor ever craved. But one day, with a load of fresh ears staring up at me, I spied a recipe for “Grilled Lime Chicken with Creamed Corn” that nudged me to get to work in the kitchen. The recipe is from “Culinary Birds: The Ultimate Poultry Cookbook” (Running Press), of which I received a review copy. 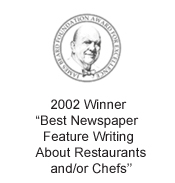 The book, by esteemed Chef John Ash, was the recipient of a James Beard Award this year. 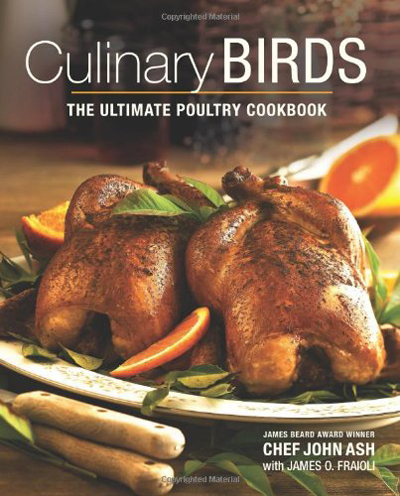 It includes 170 recipes for a wide range of poultry — from duck and goose to even partridge and dove. 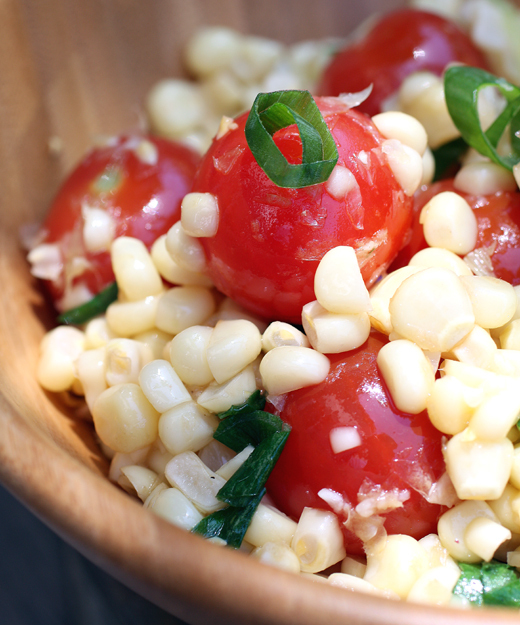 In this recipe, the creamed corn gets a grassy note from poblano chile. It forms a bed for the chicken that is marinated in lemon juice, olive oil, honey, chili flakes and a touch of cumin before being grilled. A bright and simple sauce of lime juice, olive oil, honey, cilantro and jalapeno is whisked together and spooned over everything just before serving. The creamed corn is lush and rich, of course. But the zesty punch of the vinaigrette helps cut through that so that it doesn’t end up being as heavy as you may fear. The chicken cooks up moist and flavorful. The recipe calls for boneless, skinless chicken thighs, but I think next time I would opt for skin-on thighs because the crisp skin would provide a nice textural contrast to the softness of everything else on the plate. Sure, you add a few more calories with the skin, but come on, this is hardly a diet dish anyway — not with a cup of cream used to cook the corn. Speaking of which, the recipe states that this serves four. 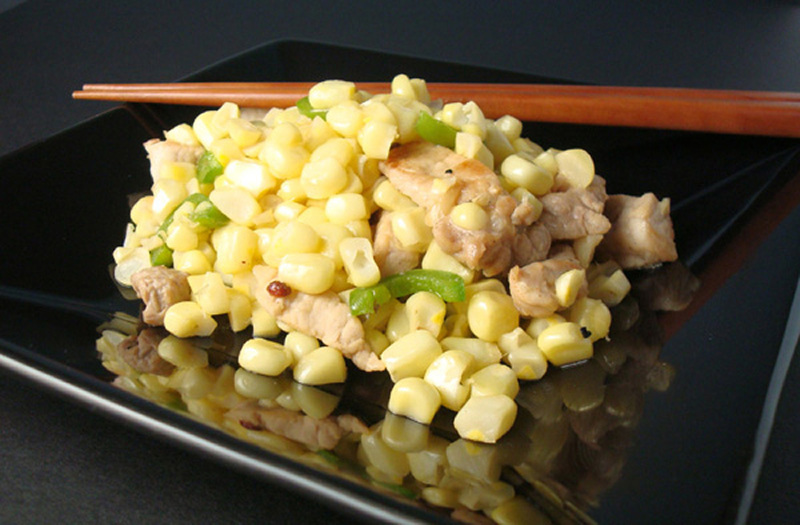 But with six ears of corn, you end up with a really generous amount of creamed corn per serving. But you can always save any leftovers for lunch the next day to go with a simple tomato salad to round things out. My corn addiction may be serious. But it’s one habit that I know will last only as long as summer. Now, my gummi bear obsession is something else entirely…. 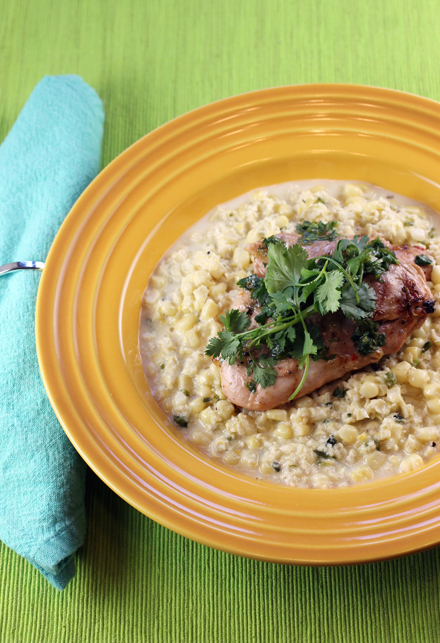 Creamed corn livens up grilled chicken thighs. Whisk 1/3 cup of the lime juice, 2 tablespoons of the olive oil, 1 tablespoon of the honey, 1/2 teaspoon of the cumin, and the chili flakes together and pour the mixture into a shallow dish. Add the chicken, turn to coat, and marinate covered in the refrigerator for at least 1 hour and up to 4 hours. Meanwhile, put half the corn into a food processor and pulse a few times to finely chop. Place the processed corn in a saucepan with the remaining whole corn kernels, the stock, the remaining 1/2 teaspoon of cumin, and the cream. Bring the mixture to a simmer over medium heat, stirring constantly, until thick, about 10 minutes. Season to taste with salt and pepper. Stir in the poblano and keep warm. Remove the chicken from the marinade and season liberally with salt and pepper. On a medium-hot grill, cook until just cooked through, about 5 minutes per side. While the chicken is cooking, stir together the remaining lime juice, olive oil, honey, cilantro, and jalapeno and season to taste with salt and pepper. Divide the creamed corn among 4 warm soup plates. Place a grilled thigh on top and spoon the cilantro mixture over top. 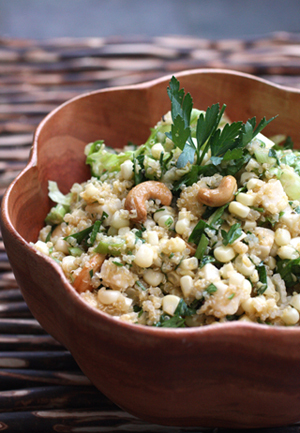 Serve immediately, topped with cilantro sprigs. I don’t make creamed corn often (maybe ever couple of years), but it’s really good stuff. It looks so great in this recipe! Great combo with chicken. You have a gummi bear obsession? Too cute! 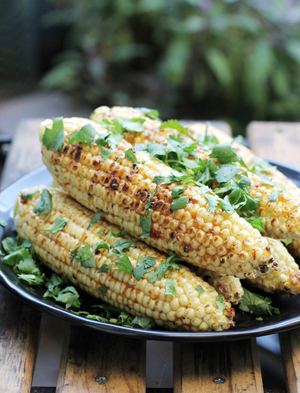 I’m with you about summer sweet corn… the stuff is irresistible! I’ve always been a straight up corn on the cob kind of girl, but I’m now a convert to creamed corn too. So easy and good. John Ash’s recipe looks awesome! This looks amazing! And I appreciate the tip for the leftovers – some fresh tomato sounds like the perfect pairing! And doesn’t have an addiction to gummie bears?! Thanks for the recipe, great summer dish! Love the title of your post :). 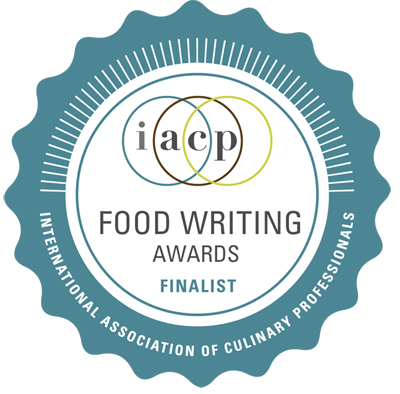 That creamed corn plate looks delicious and definitely a book to check out. I love corn! Cream corn is great too. 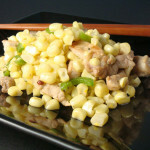 i like lime zest on my grilled corn, so the lime chicken is a great feature! this looks delicious. Wow! 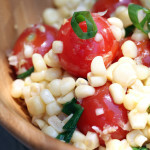 This is a stunning recipe and I only wish I could buy fresh corn in Nantes! I can’t but I’ll look for it. 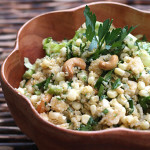 I love these bright, fresh flavors, the spices and honey, the cilantro. Beautiful! I’m glad you selected this recipe from the book to share with us! 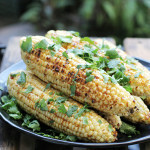 Oh we love corn and have been grilling it on the cob a lot lately. This creamed corn looks delicious!